Overnight on Friday, 31 July, a group of masked Jewish settlers threw firebombs through a window of the Dawabsha family house in Kufr Douma, near Nablus. They fell in the bedroom where the whole family had been sleeping peacefully, setting the house on fire. The arsonists left graffiti, reading “revenge” and “long live the Messiah”, alongside a Star of David on the walls as their footnotes to this atrocious attack. They then fled, according to local witnesses, to the illegal settlement of Ma’aleh Ephraim, where approximately 1,800 armed settlers live under the security of the Israeli occupation forces. 18-month-old Ali Dawabsha was found a charred body. The rest of the family, Ali’s parents and his four-year-old brother, survived the fire with critical injuries. The aftermath inside the house is horrifying: utter destruction and black walls, burnt clothes and photos of the family laid on the ground, among them Ali’s smiling photos and his tiny white bib reading “Good morning Mama”. This Israeli attack is another crime in the never-ending Nakba the Palestinian people have endured since Zionism’s inception. 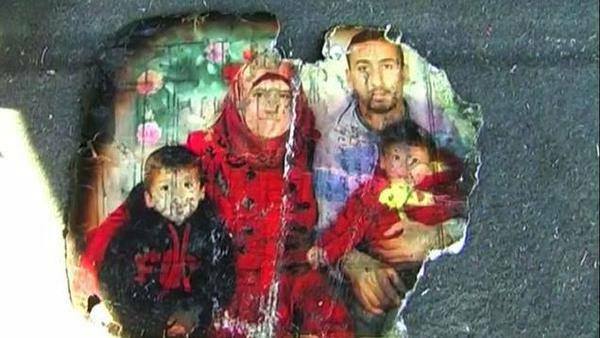 Ali is another Mohammed Abu Khudeir, who was burnt alive by a group of settlers in Jerusalem on 2 July 2014. He is another Palestinian child falling prey to the Israeli murder machine, as Palestinians commemorate the first anniversary of Israel’s 51-day offensive on Gaza, which it called ‘Operation Protective Edge’, during the summer of 2014. Over 2,200 people were brutally killed, mostly civilians, including 551 children. This morning Israeli leaders rushed to feign humanity and condemn the arson, calling it a “terror attack”. The Times of Israel reported that Natanyahu expressed his “shock” at what he called a “horrific, heinous act”, before saying, “The State of Israel deals forcefully with terror, regardless of who the perpetrators are.” It also reported that Netanyahu’s remarks were echoed by Defense Minister Moshe Ya’alon and the Israeli Defense Forces. At the same time, heavily armed Israeli forces spread across the West Bank to employ collective-punishment policies against Palestinians and prevent any rage from being expressed. As I write this, several injuries to Palestinians were reported after Ali Dawabsha’s funeral. Update at 11 pm: One of the injured people, 14-year-old Laith al-Khaldi just passed away. As a Palestinian who is well-informed about the history of bloodshed and dispossession inflected on Palestinians who collectively bear the trauma of our encounter with Zionism, and one who carries the memories of many brutal Israeli attacks on Gaza, this claimed “shock” didn’t hit me. It rather outraged me at Israel’s crocodile tears and pretentious humanitarianism, despite its brutal military occupation of West Bank, the continued expansion of its illegal settlements, the suffocating siege of the Gaza Strip that remains in ruins after Israel’s genocidal war last summer, and its ongoing assertion of itself as a “Jewish state”, not a state for its citizens, as it discriminates against 1948 Palestinian citizens of Israel, or what its leaders call a “potential fifth column”. The world should not look at today’s appalling incident as a singular event. It is another link in the Zionist settler-colonial mentality which always sees Palestinians as an existential threat, dehumanises us and constantly views us as inferior and marginal. Israel cannot absolve its responsible for these settlers’ acts, nor pretend they don’t represent its own warped morality. Israel is the one to blame, not only because it encourages illegal settlements to expand, arms settlers with advanced weapons and further protects them with its “defence” forces, but also because these actions are an extension of the longstanding Zionist enterprise that, as much as it sought to dehumanise Palestinians, in return dehumanised Israeli society. This is evident in the Israeli cultural discourse, which celebrates Israel and portrays it as a “heroic,” while ignoring the political and humanitarian costs “others” endure due to its “successes”. The persistent portrayal of Jews as “victims,” facing “hostile” and “terrorist” Palestinians, also feeds this mentality. Even Israeli children’s books are exploited to demonise Palestinians and Jew as victims against terrorist “Arabs”. Today’s attack cannot be decontextualized. It is deeply connected to Israel’s celebrated “War of Independence,” which declared Israel as a Jewish state after a systematic process of ethnic cleansing that ranged between massacres, like that of Deir Yassin, to psychological violence, and made almost a million Palestinians refugees. These acts of terror reproduce the same mentality that led to the Kafr Kassim massacre of 1956, whose perpetrators were pardoned and freed after a year. An Israeli border police unit, for no reason whatsoever, opened fire at Palestinians returning from their farms, unaware of the new military curfew imposed on their village. The gunfire killed 49, almost half of them children. It is also the same mentality that led to the second mass expulsion of Palestinians in 1967. We fired such shots every night on men, women and children. Even during moonlit nights when we could identify the people, that is distinguish between men, women, and children. In the mornings we searched the area and, by explicit order from the officer on the spot, shot the living, including those who hid or were wounded, again including the women and children. And again, it is the same attitude that blames Palestinian civilians in Gaza for the collective punishment against them and periodic attacks that are, by Israel’s own dehumanising description, nothing more than “mowing the lawn” . The last Gaza attack was only the latest episode in this ongoing war of alleged “self-defence”. The arson attack should be seen within this context of the Zionist state’s history of negating Palestinians and relentless attacks against our very existence. Most international media covered it as “unique” before emphasising Israeli leaders’ condemnation of it, suggesting that it was not representative of the state. It is absolutely representative and should be received with outrage, not against setters’ violence, but against their host regime that has been built and lives on terror, yet continues to be celebrated in the West’s political and cultural discourse, feeding its impunity. We should demand not just denunciation of this atrocious attack against 18-month-old Ali Dawabsha, but delegitimization of Israel and its Zionist ideology that produces and endorses such violence, and has long justified it morally and politically. This entry was posted on July 31, 2015 by Shahd Abusalama. It was filed under Reflections and memories and was tagged with #GazaUnderAttack, Illegal settlements, Israeli Defense Forces, Jewish Settlers, operation protective edge, West Bank, zionism. Be strong and keep the struggle going. Although I am in far away Chennai , my heart is with you. Take care of your children and watch over them. It is not their struggle right now but will probably soon become theirs. Until then, keep them safe. Let them not engage with the Zionist army , the terms are too unequal, but keep them in the hope that your problems will end before the next generation. I tried to view this post but got “Oops, what you are looking for could not be found.” message. Seems you are being censored Shahd. Greg Thomas. The world must combat the zionism as did with the nazism, because they are similar. I believe both sides are at fault for this ongoing altercation which has been kept fomenting for at least 2000 years according to the KJ bible’s OT . WHY is the question ! When are people going to step up to the plate and take a strike without retaliating !!! The other side is always looking for a reason- to strike back ! Quit being adolescent & BE the people you are meant to be ! Tolerance is presently on the side of the Palestinians !!!! Can’t Israelis be the example Hashem has been waiting for. You are to be the example, atop of the hillside= HaShem’s way, not yours !!! Give a people a break Israel. Perfection is lacking on BOTH sides 1 ENOUGH SAID ! This terrorist attack is horrible and was condemned by the Israeli government. The attack is not “a result of Zionism” – it’s a result of terrorism and extremism. Zionism means to support the Jewish people’s right to Israel as its’ independent state, and there are different kinds of Zionism. I’m a Zionist, but I don’t support the right-wing Religious Zionism of the settler movement. I support the two-state solution and I’m against harrassments of civilians in any way. The Jewish people’s right to PALESTINE you mean? Return to history books, read the Israeli historian Ilan Pappe’s The Ethnic Cleansing of Palestine. Israel didn’t exist before they ethnically cleansed almost 800 thousands of Palestine’s indigenous people like my grandparents.